It may be of limited concern to 95% of people, but the Local Government Boundary Commission is consulting on the size of Cornwall Council. Their proposal involves an unprecedented cut in the number of elected representatives and the consequent ability of communities in Cornwall to influence policy. While no-one is shedding any tears over Cornwall Council, Cornwall is again being singled out for special and unfair treatment. Here’s the start of my submission to the Boundary Commission …. The Local Government Boundary Commission for England (LGBCE) claims on its website that it provides ‘electoral arrangements for English local authorities that are fair for voters’. They may be fair in respect of England but the proposal to cut Cornwall Council’s size from 123 to 87 councillors is patently unfair to the Cornish voter. It drastically undermines Cornwall Council’s ability to represent the interests of residents or respond to the concerns of local communities. 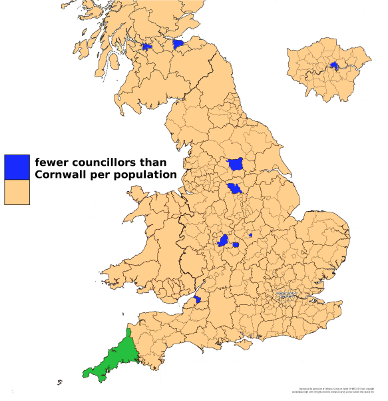 Why is democratic representation in Cornwall being reduced to such a level that it becomes one of the least well represented areas in the UK? Why does the proposal for council size in this review vary so dramatically from recent reviews for similar unitary authorities and county councils? Why did the LGBCE ignore the clear advice of the majority of representations received from Cornwall Council, the two mainstream political parties and others in the first phase of its review? The above questions are dealt with in turn below before I conclude with some speculation on the context of this review and suggestions for change. …. you can read and/or download the rest of the submission here.